Tag Archives for " Switcher Studio "
YouTube is limiting live streaming from its native mobile app to channels with a minimum of one thousand subscribers. But that doesn’t mean you can’t go live from mobile to YouTube regardless of your subscriber count. 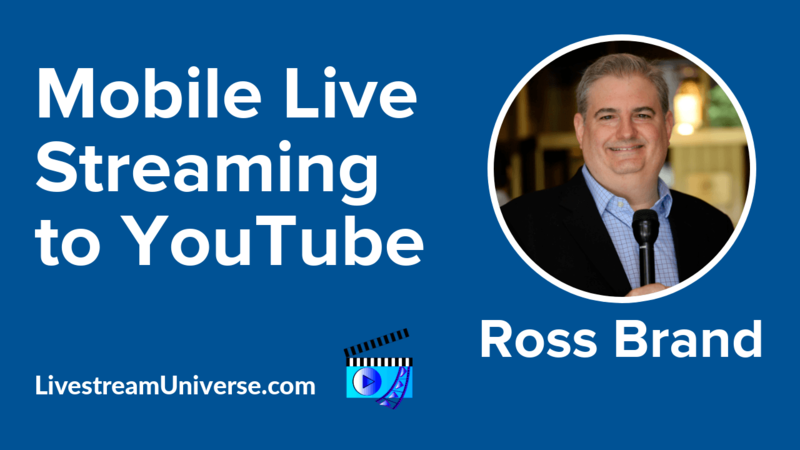 Here are some of the best options for streaming to YouTube Live from mobile. Ross Brand with your Livestream Universe Update and Flash Briefing for Monday, June 11th, 2018. Marc Gawith spearheaded the growth of .LIVE domains into popular branding assets for live streamers during his time at Rightside. 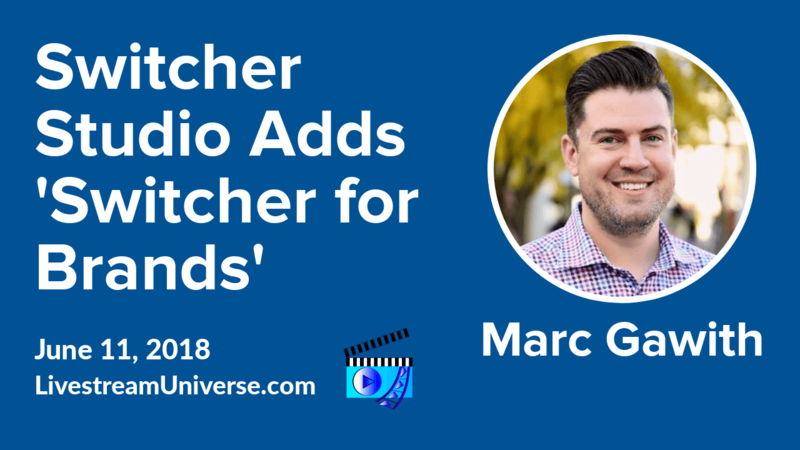 Five months ago, Marc joined Switcher Studio. On LivestreamDeals, he talked about his new role with the iOS live video production app. Why has Switcher Studio become the choice for so many mobile live streamers? You can hear the entire interview with Marc Gawith on the Livestream Universe Facebook page. 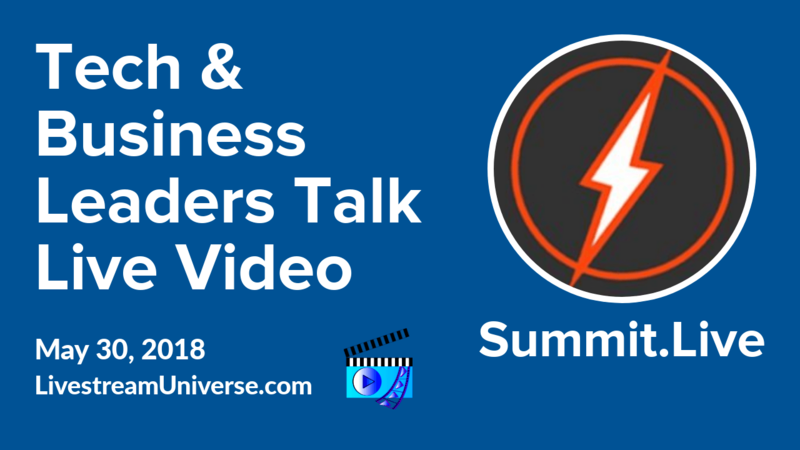 Also featured in this episode of #LivestreamDeals: Claudia Barberio and Dan Pisarski of LiveU, Andrew Haley of Wirecast and Madalyn Sklar of the Video Like a Rockstar Mastermind. At 3pm ET, Owen Video hosts BeLive Weekly. That’s on the BeLive TV Facebook page. Ross Brand with your Livestream Universe Update and Flash Briefing for Friday, June 8th, 2018. LiveU Solo users can now add live graphics to their videos from the Solo portal. 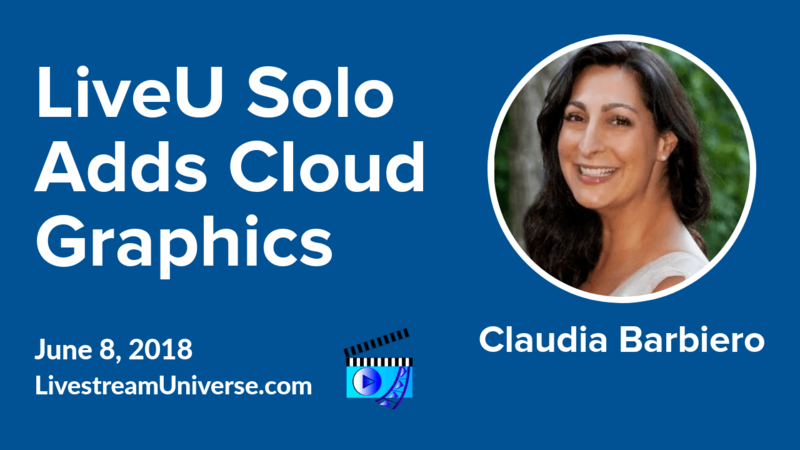 Last night on #LivestreamDeals, Claudia Barbiero — LiveU’s VP of Marketing & Live Events Production — said it’s easy to add visual elements to your livestreams. Dan Pisarski is LiveU’s VP of Engineering for North America. He talked about the advantages of cloud-based graphics for live streamers. At 3pm ET today, Eddie Garrison hosts EG Live. He’ll be talking about the power of visual content. View on Eddie’s personal Facebook profile. 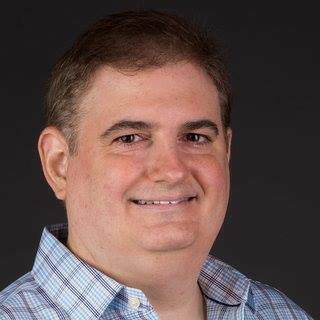 At 5pm ET, it’s Ask Kirk Lockhart — the Online Media Strategist on RadioBuzzD. View on the RadioBuzzD Facebook page. 9am ET is Nimmin Live with Nick and Dee helping you grow your YouTube channel. View at YouTube.com/NickNimmin. 10:30am ET is Ask The Podcast Coach – Dave Jackson and Jim Collison take your questions at askthepodcastcoach.com/live. At 11am ET, it’s Fork It Over Radio with Leslie Nance of go2kitchens and her husband/sidekick Robin. Improve your health through your kitchen. View on Periscope or on the Fork It Over Radio Facebook page. And Sunday at 2pm ET, it’s the Live Stream Insiders. Krishna De and Peter Stewart discuss developments in live streaming on the Live Stream Insiders Facebook page. Show & event links at our website. For LivestreamUniverse.com, I’m Ross Brand. Have a great weekend! Ross Brand with your Livestream Universe Update and Flash Briefing for Thursday, June 7th, 2018. When building a brand for your business and yourself, how you come across on video can go along way toward creating a lasting impression. Of course there is a time and place for real and raw unpolished videos. To set yourself apart as a professional, however, you need the right production tools and broadcasting skills. 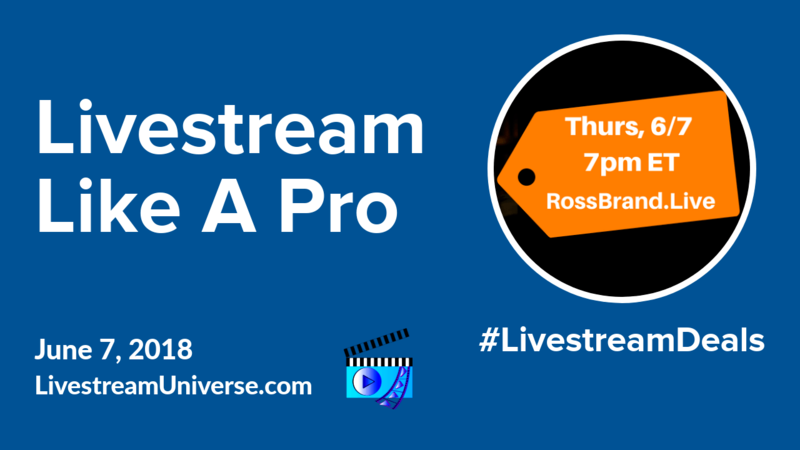 Today at 7pm ET on #LivestreamDeals, we feature the leading desktop and mobile production software solutions, a hardware encoder for going live from the most bandwidth challenged environments, and a mastermind program to develop your on-camera skills and confidence. Guests include Claudia Barbiero and Dan Pisarski of LiveU, Andrew Haley of Wirecast, Marc Gawith of Switcher Studio and Madalyn Sklar of the Video Like a Rockstar Mastermind. Join us at 7pm ET on the Lifestream Universe Facebook page to shop the shop with special offers and giveaways. At 2pm ET, it’s Lunch with Leslie, hosted by Leslie Nance. Make your body inhospitable to cancer through your kitchen as Leslie shares delicious, healthy recipes. View on Twitter Live at @go2kitchens. At 3pm ET, it’s Live Positive with Jeff Adams on the BeLive TV Facebook page. Digital Journalist and Livestreamer Jeff-in-High-Def — aka Jeffrey Fitzgerald — will talk about the future of video. At 9pm ET, Jim Collison hosts Home Gadget Geeks. View at theaverageguy.tv/live. And if you missed it yesterday, be sure to make time for a must-see replay of Brad’s Live. Brad Friedman and Bryan Kramer talk about the human side of marketing and technology. That’s on The Friedman Group Facebook page. Join us at 7pm ET for #LivestreamDeals on the Livestream Universe Facebook page. RossBrand dot Live takes you there! Ross Brand with your Livestream Universe Update and Flash Briefing for Friday, June 1st, 2018. Stephanie Liu shared how she put together an 8-camera livestream produced with Switcher Studio. Along with her guest Jenn Baker of Vernon Mack, Stephanie takes you behind the scenes, sharing the planning, execution and promotion of the multi-camera shoot. That’s on the Hey Stephanie Liu Facebook page. 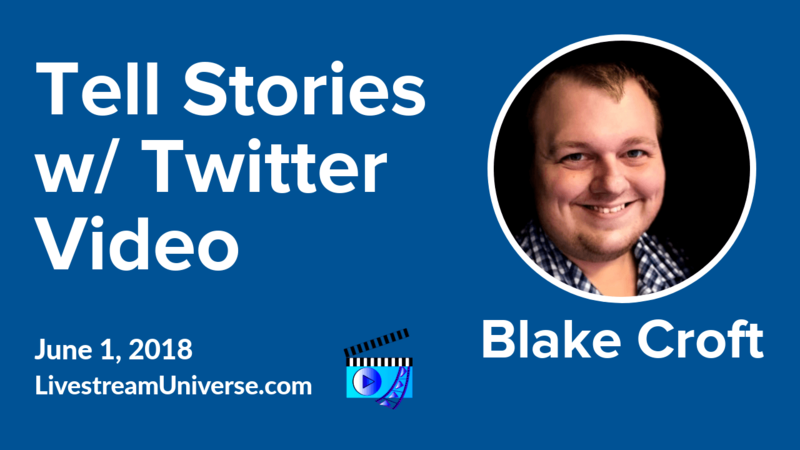 On the #TwitterSmarter After-chat livestream, guest Blake Croft joined Madalyn Sklar. They discussed using Twitter video to successfully convey your story. That’s on the Learn with Madalyn Facebook page. At 3pm ET today, Eddie Garrison hosts EG Live. He’ll be talking about content marketing that sells. View on Eddie’s personal Facebook profile. Ross Brand with your Livestream Universe Update and Flash Briefing for Wednesday, May 30th, 2018. Today’s theme is tech and business as Summit Live holds the first of four one-day events. This one is in San Francisco with upcoming summits in LA, New York and Las Vegas. You can view the livestream of today’s sessions at Summit.Live. Speakers include Eddie Vaca of AmpLive, Ryan Bell of NASA, Rudy J Ellis of Switchboard Live, Nick Mattingly and Marc Gawith of Switcher Studio, Dave Basulto of iOgrapher, and Rebecca Stone of LiveRamp. Plus speakers and panelists from Microsoft, Salesforce, BrandLive, Hortonworks, Eventbrite and Epiphan Video. Congratulations to Dave Jackson of the School of Podcasting on obtaining industry immortality. Dave will be inducted into the Academy of Podcasters Hall of Fame at an award’s ceremony in Philadelphia on July 24th. Dave livestreams his weekly Ask The Podcast Coach show on YouTube Live. At 2pm ET, it’s LegalHour.Live with Mitch Jackson and Joey Vitale. They’ll be discussing workplace arbitration agreements in light of the recent Supreme Court decision. That’s on the LegalHour.Live Facebook page. At 3pm ET, it’s Camera Confidence Live with Molly Mahoney. She’ll share 3 keys to kicking your business into high gear. That’s on the BeLive TV Facebook page. And if you didn’t catch our Best of BeLive discussion on how to grow your business with livestreaming, the replay is available on the BeLive TV Facebook page.